information in one place highlighted the many exceptional efforts by our faculty, staff, and students that make M&I a supportive environment that fosters success and creates a sense of belonging. As well, carrying out this self-assessment and “visioning” process yielded many ideas for exciting new initiatives in teaching, research and community engagement that should keep us busy for quite a while. The most memorable departmental event for me this year was the fundraising gala in honor of Bill Ramey that was organized by the Microbiology and Immunology Student Association (MISA). If you were an undergraduate in M&I in the past 35 years, you undoubtedly had Bill as an instructor and are familiar with Bill’s exceptional dedication and commitment to mentoring and advising students that extends even beyond graduation (e.g. he writes an estimated 100 letters of recommendation every year). In the MICB 421 course, Bill guides groups of students through a research project and the writing of reports that are in the form of a scientific paper that is published in the department’s on-line “Journal of Experimental Microbiology and Immunology (JEMI). This is an exceptional learning experience for the students that Bill developed and has carried out for many years. 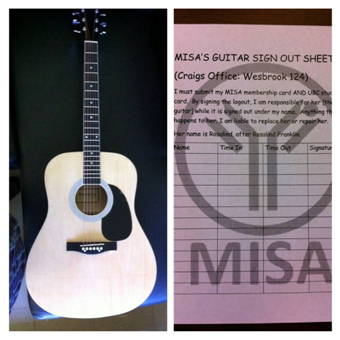 In recognition of his impending retirement at the end of June 2014, this year’s MISA group organized a gala evening in Bill’s honor that was held on Saturday March 1, 2014. The attendees included current students, alumni, faculty members, and many of Bill’s colleagues. The heartfelt speeches thanking Bill for his efforts in training, supporting, advising, and mentoring students were a phenomenal outpouring of respect and admiration. Clever musical tributes were performed by the M&I house band: the Three Tenures -- George Spiegelman (back from retirement), Bob Hancock, John Smit, and not-yet-tenured Dave Oliver. For me, the best part was seeing Bill beaming all night long, surrounded by his “posse” of students, who all wanted one last photograph with him. As one of the most important people in their “academic” lives, it is not surprise that Bill was always the prof that was in most in demand to be photographed with students at the annual MISA graduation banquet. This wonderful evening was part of MISA’s goal to raise funds for an endowment that would create an annual award in Bill’s honor for a student who enriched the M&I undergraduate experience in a significant way. What a very fitting way to honor Bill’s legacy to M&I! It also speaks to the exceptional character of the students who led this initiative. In leading this event and others, the MISA members demonstrated exceptional leadership, as well as an impressive commitment to creating a supportive academic and social environment for the students in our programs. They are really exceptional young people. I am very proud to know them, and to say that they are our department’s partners in building a great learning environment. Another key event for M&I this year was having Dave Oliver join us as a new instructor. Some of you may know Dave from when he was a PhD student in Rachel Fernandez’ lab. After his graduation, Dave did a post-doc at SFU, worked in the biotech sector, taught courses at both UBC and BCIT, and was involved in the joint UBC/BCIT Biotechnology program as an industry representative. Hence he brings an outstanding background and new perspectives that will allow him to put a unique spin on MICB 421 and other courses that he will teach. As well, Dave has a very strong interest in outreach and community engagement and is looking forward to working with other department members on current and new initiatives. Dave’s musical talents have given him an important role as a new member of the Three Tenures, in particular introducing modern music into their repertoire! Of course “modern” is a relative term. For many of the undergraduates that heard the Tenures perform at the Bill Ramey fundraising gala, the Oasis song might be considered their parents’ music. Julian Davies is always in the news, and making news, and this year is no different. 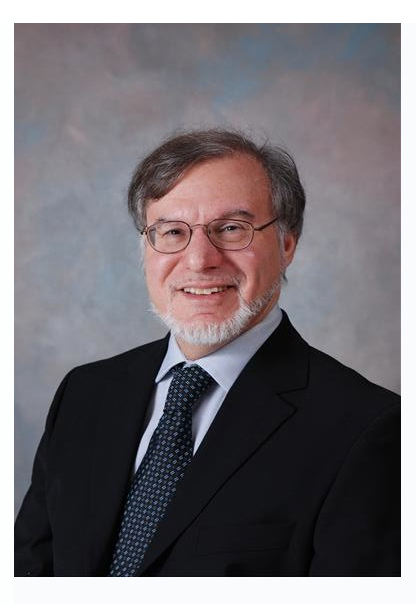 We just learned that Julian was elected to the US National Academy of Sciences as a foreign associate. This is very well deserved recognition of Julian’s extraordinary career and his many groundbreaking scientific contributions. The Life Sciences Institute will be throwing a big party for Julian on May 23, following a seminar by Julian at which we expect him to regale us his usual mixture of science, history, personal experiences, and humor. If our calendar runs from May graduation to May graduation, then this is an outstanding way to top off what has been a terrific year for our department. This past year, the Microbiology and Immunology Students Association (MISA) successfully built on our club’s mission to enrich MBIM student life. We’ve continued to engage MBIM students in Academic Events, Social Events, Sports, new Infrastructure developments (e.g. improving the MBIM lounge and our online presence), and added many New ideas and events to the roster. Our two most popular academic events were (as always) ‘Research Night’ and ‘Careers Night’ (both picture above). For many 2nd and 3rd year students, Research Night is their first glimpse at how they can get experience in UBC labs. Workshops discussed award and grant options, such as NSERC and SSRP, how to gain volunteer experience in labs, and how to participate in co-op. Afterwards, graduate students presented their research at a poster session where participants could ask questions. After this event, I was approached by a student who said it was Research Night that solidified his desire to pursue a degree in MBIM. At Careers Night, students participated in a “speed-mentoring”session where they each had some time to talk with MBIM alumni. The MISA Mentorship Program brought together 1st and 2nd year mentees with 3rd and 4th year mentors, providing 1st and 2nd year studentswith insight and 3rd and 4th year students with an opportunity to “give back” to the University. Beyond our academic activities, we continued Influenza Vaccine Day, an event where MISA students host an immunization station in collaboration with Risk Management UBC. It has been eleven years since starting up the Abraham lab! With operating grants secured, we are entering our third wave of recruiting new trainees and have opened exciting areas to pursue. 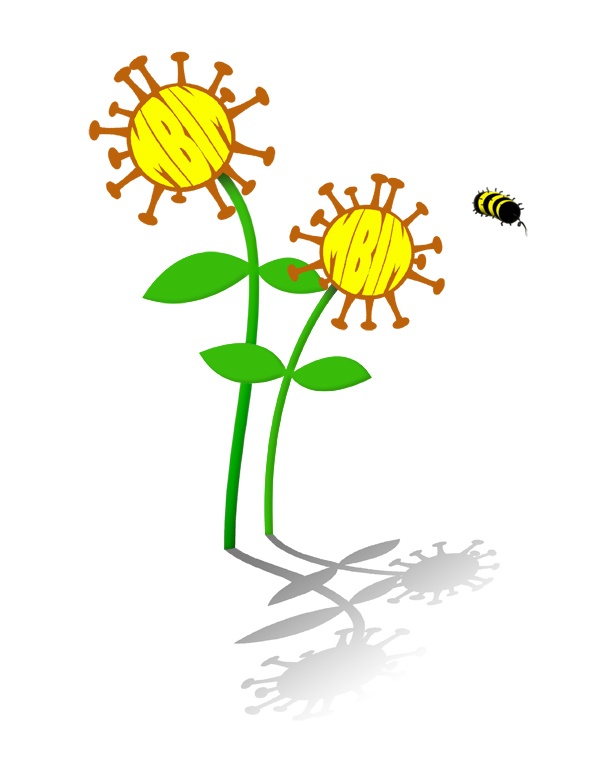 Our focus is the cytokine interleukin 7, a key immune signal that controls the activity of much of the immune system. For the last few years, we have investigated how the interleukin-7 cytokine family affects the airway immune response to influenza virus. Adam Plumb successfully demonstrated that IL-7-mediated signals are essential to clear an Influenza infection. He also, unexpectedly, found that differences in the host such as commensal microbiota – the bacteria that live in our guts – may alter the immune system’s behavior during influenza infection, even in the lung. Daniel Patton has investigated the requirement for IL-7 signaling by developing B cell precursors, that interestingly, develop into mature B cells that show no defects in antibody production except in a gut parasite infection model (collaboration with the Perona-Wright lab). biology expertise (Jeremy Wulff and Marty Boulanger, University of Victoria) with immune biology (Jung HeeSeo) to perform drug screens in collaboration with the Centre for Drug Research and Development. 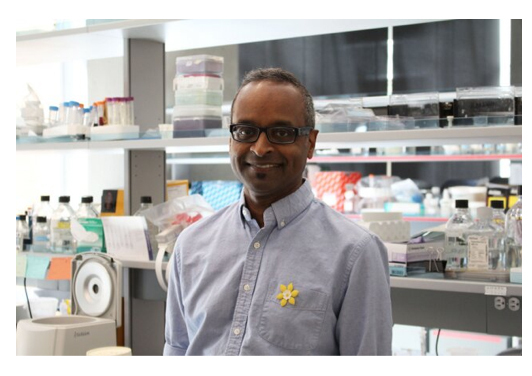 The Canadian Cancer Society, who funded this work, has highlighted this in their “Spot the daffodil” campaign! See: https://twitter.com/cancersocietybc. Finally, I am pleased that the I3 research group held its 3rd annual outreach in the Day of Immunology. This event has evolved with enthusiastic contribution from graduate students, technicians and faculty to show elementary school students the basics of the microbial world, how the immune system deals with this, illustrates vaccine-pathogen dynamics and showcases immunological approaches used in the LSI. This year, 80 students from 3 schools visited us in the LSI tolearn about their immune system and its role in health and disease. 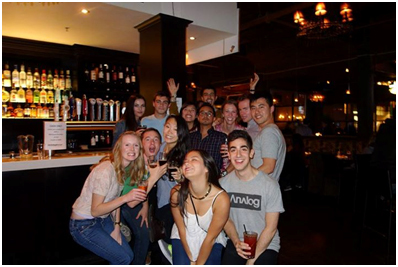 Social events bind MBIM students together as a cohesive community. 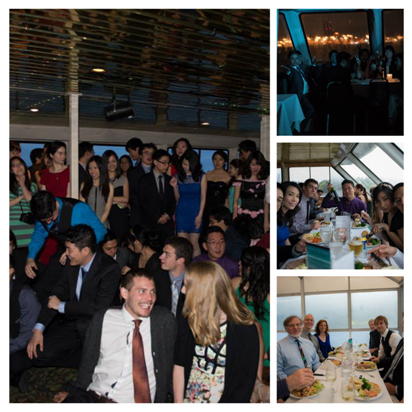 This school year we held a social event roughly every two weeks. 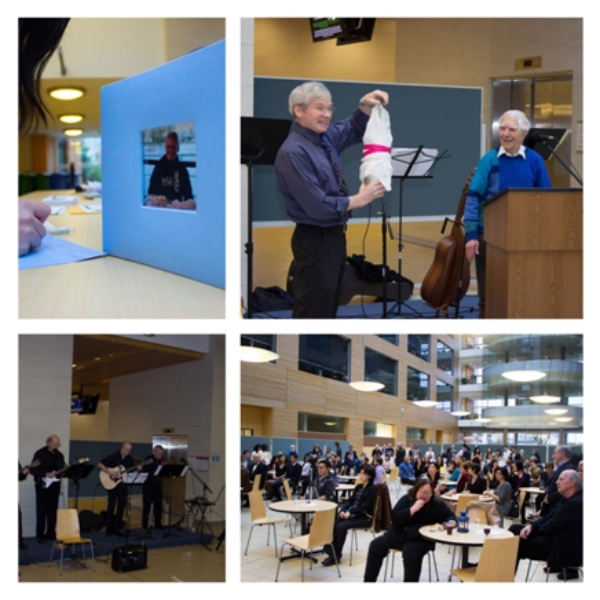 These included Pub and Karaoke nights (picture above), a Talent Show, our year-end Spring Banquet (pictured beside), Nerd Love (Science-wide dance), our Welcome Back BBQ and more. The MISA executives believe that some of our strongest bonds are forged through sport. 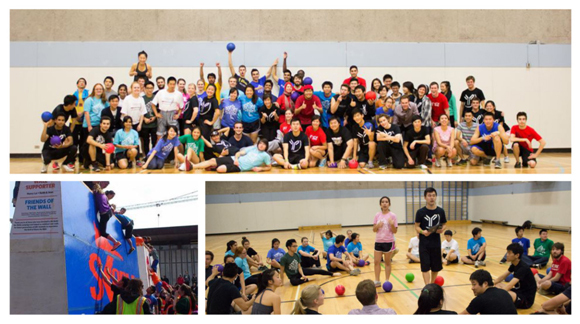 This year, we had a Volleyball and Ultimate Frisbee team competing throughout the year in UBC Rec sports. We also had teams in many of the other campus wide Rec sports such as Storm the Wall (picture below), Day of the Longboat, and Gladiator. We also planned our own events as part of our continued rivalry with sister club BIOSOC (Biology Society). We happily defeated BIOSOC at Dodgeball (picture below) and some of the other sports we played against them. We’ve also seen virtual growth online. Our Facebook (facebook.com/ubcmisa) ‘likes’ have doubled from 600 to 1200, suggesting a growing audience, and an effective communication portal for up and coming MISA students. We also continued to develop our Youtube channel at https://www.youtube.com/user/ubcmisatube which has now received over 7000 views. 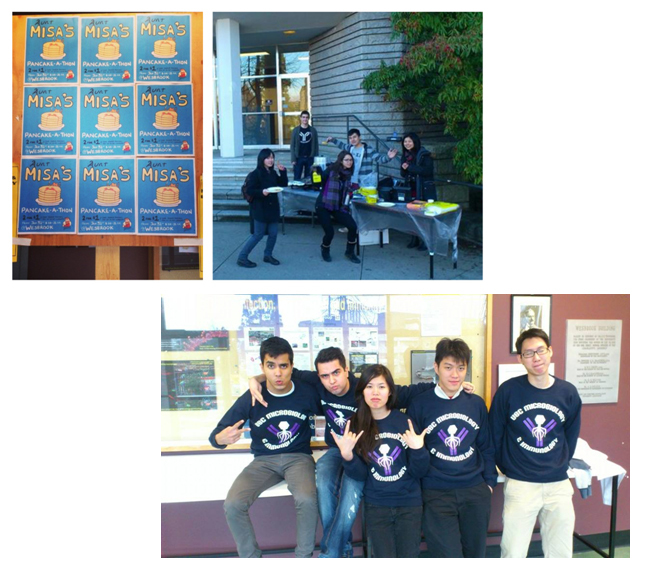 Just like last year, we’ve maintained our website at ubcmisa.org where students are able to easily find information and sign up for events. This year we introduced some successful New events. We initiated had a Tie-Dye Icebreaker, which we will now have at the beginning of every year, where students tie-dye their lab coats (event pictured above). Another successful event was our Aunt MISA’s Pancake Breakfast fundraiser (pictured below). Students were able to grab pancakes on their way to morning classes. Other fundraising efforts included our new crewneck sweaters pictured below. department to establish an endowment fund for a yearly award in Dr. Bill Ramey’s name. This award will be given to students yearly who exemplify Dr. Ramey’s dedication towards the department. Copyright © 2014 UBC Microbiology and Immunology, All rights reserved.